News just in from the Y.CO brokers as the 49.8m motor yacht Pestifer I has a further price reduction, this time of $2 million. She was built by CRN in 1998 and, Lloyds classed and MCA compliant, she can accommodate eight guests in a master, two doubles and one twin stateroom. Conceived for a very discerning owner wishing to cruise with a small number of close friends, Pestifer I is most definitely an ‘owner’s yacht’. Completed to the highest possible specification, Pestifer I is full of pleasant surprises, both in her engineering and her interior finish. She has recently been surveyed by Patton Marine, all of whose recommendations have been put into effect, and a Stability Booklet was issued by Lloyds. All certificates of compliance are up to date. 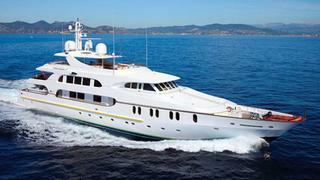 Pestifer I is now asking $10 million, down from $12 million.